Does managing money have you stressed out? Are you tired of reading books that are filled with “fluff” and that take weeks to read? If this sounds familiar, then The Super Duper Simple Book on Money is just for you. You will be able to read the book in less than an hour; and it will be a financial resource that will help you for the rest of your life. The book is filled with worksheets, videos and other important resources to guide you. 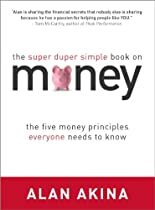 The five money principles everyone needs to know will get you started on the right foot. This entry was posted in Money on September 23, 2016 by admin.